Before I start in on the nutritional benefits of asparagus, I’ll get the strange stuff out of the way first. 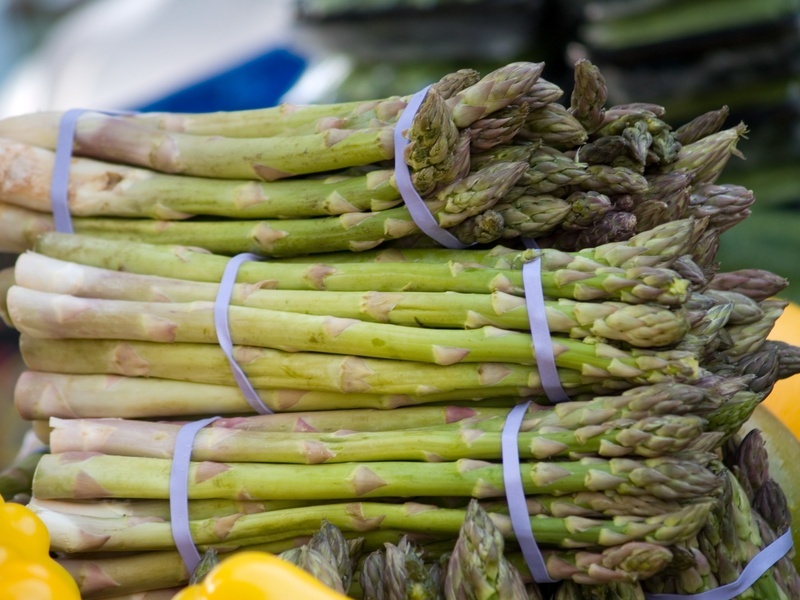 You know – that whole thing about why your pee smells weird when you eat asparagus. Not that I would know, but aren’t you interested? Oh? You didn’t know that? Maybe you’re one of those people who a) doesn’t eat asparagus – at least not in large enough quantities, or b) your body doesn’t form thiol chemicals. Here’s the “abstract” explanation according to scientists from the Department of Biochemistry at the University of Birmingham in England. Those Brits are an interesting bunch, aren’t they? One cup of steamed asparagus is only 43 calories and is absolutely packed with health-promoting nutrients. It’s high in antioxidants, is an excellent source of vitamin K and the energy-producing B vitamins, is rich in sleep-promoting tryptophan, and is loaded with calcium and magnesium, which helps maintain bone strength. Asparagus also contains lots of fiber and inulin, which we don’t digest, but it does become snack food for our friendly bacteria. We want our good bacteria to overcome our bad bacteria. Can’t you just imagine the microscopic turf war going on in your gut? Well, maybe not, but trust me, we want the good guys to win and inulin provides strength to the army. Toss asparagus with olive oil and garlic. Place in glass baking dish; season with salt and pepper. Bake for 15 to 20 minutes, or until asparagus is tender and lightly browned. Stir occasionally. Remove from oven and toss with lemon juice. * Research shows that mincing or finely chopping garlic enhances the health-promoting benefits. Once chopped, a chemical reaction occurs releasing the pungent “garlicy” smell along with a substance called allicin, which provides garlic with its powerful antibacterial and antiviral characteristics. To get the most benefit from allicin, let the finely chopped garlic sit for 5 to 10 minutes before cooking. This allows the chemical reaction to take place allowing the allicin to form. It’s worth the wait! This entry was posted on Wednesday, April 9th, 2008 at 7:14 pm	and is filed under Seasonal Foods. You can follow any responses to this entry through the RSS 2.0 feed. You can leave a response, or trackback from your own site. I love asparagus and I’ve heard the rumor, but never experienced it. I just made a huge batch of asparagus, bought at the local farmer’s market for $0.99 a pound. My favorite way to cook it is take 1tsp olive oil in your hand and rub it all over about 2 pounds of asparagus (a little goes a long way!). Then place in a flat layer on a pan covered in tin foil and generously apply some kosher salt. Bake for 20 min at 400 degrees. Although adding garlic, pepper and lemon can’t possibly hurt! I’ll make it your way next time! can’t wait for our asparagus season to start – it’s not really till the end of May and is over in a blink, but I really can’t condone those folks that have it flown in from chile and argentina in the middle of winter. Shame on them. Hahaaa! I love that you brought up the pee/asparagus thing. It seems to be a taboo topic among a lot of people, but I find it really interesting that a food can do that! I love your recipe; sounds simple and delicious! Melissa, I changed my settings, so I think you should be able to post comments on my blog now…sorry about that! MMMMMMM, asparagus! I saw some asparagus today, but I’m not a great fan! Lead me to the artichokes!!! Nick — you lucky guy having the farmer’s market so early. There’s snow on the ground here! Kim — you southerners get to have spring and all the good stuff that comes with it earlier than those of us in the Rockies! Yes, eat local — as much as we can anyway. Naomi — those coconut muffins on your blog look amazing. Hey Nick, have you tried those? Hey Lizzie — yeah, asparagus does weird things. Beets too! Tiffany — oh, good! I’ll stop by and visit. Dianne — artichokes are favorites of mine as well. I just had a salad with Jerusalem artichokes, which aren’t from Jerusalem and aren’t artichokes. Weird, now that I think of it. Thank you for that lovely comment, it kept me warm all day. I love asparagus. In fact I am listening to Jamie Oliver extoll the delights of asparagus as I write! I love asparagus, and always look forward to it being in season. We usually end up eating it several times a week! Hey, Melissa – I bet you thought I had forgotten about you, but I haven’t; and this entry about asparagus made me want to send in a favorite recipe which is easy, beautiful,and tasty. Try this: Steam some asparagus very lightly, and chill. Make a nice bed of greens, top with asparagus spears. Cut up some strawberries (conveniently fresh and widely available at the same season as asparagus) and sprinkle over asparagus. Top with blue cheese (feta would probably work if you are afraid that the blue cheese is a gluten problem) and dress with Newman’s Own Light Walnut Raspberry Vinaigrette. Looks lovely, tastes great. I am a HUGE fan of asparagus (aka the stinky pee pee veggie)! During the season, I drive about five minutes to one of the many locals farms here in New Jersey and buy a pound or two. No one else in my family enjoys this tasty veggie, so I usually eat an entire pound of oven baked asparagus in one sitting. I love your idea to add chopped garlic — it’s usually just salt and pepper for mine!